Enjoy a roomier seat on our series of X-Wide Benches with Backs. 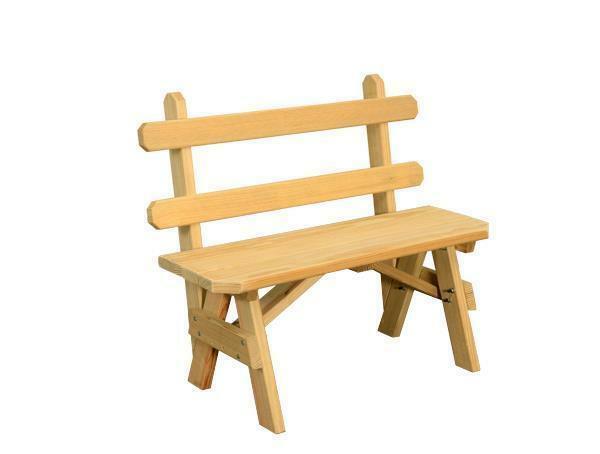 This bench is made of yellow pressure treated pine and measures 24.5" in depth, making it that much easier to sit back and relax during summer days or around the campfire. This model comes available in 5 different width options: 28", 42", 54", 66", and 90" -- enough choices to customize your seating to the table you buy or already own! See our Plain Table or Border Table, both available in 8 sizes, for a table of matching wood, design, and superior quality craftsmanship! Choose outdoor wood furniture that you know has been made to last. Width: 28", 42", 54", 66" or 90"